A white carpet aisle runner for the grandest of weddings. It contains 100% filament nylon for a soft plush texture. Includes latex rubber on the back for no slips and good for all types of weather. The sides are bounded with color matching tape for a nice, clean edge. This white wedding ceremonial aisle runner is available in widths of 3-4 feet and lengths of 10-50 feet, and everything in between. If you are interested in bigger dimensions, contact us at info@ceremonialsupplies.com or call 1-877-373-4273. The most iconic moment of weddings is the instant the double doors open, revealing the beautiful bride. Everyone in the room is starstruck, as she steps out and gracefully makes her way down the aisle. Each step is met with the soft plush of the white aisle runner that seems like she is walking on a stream of clouds. 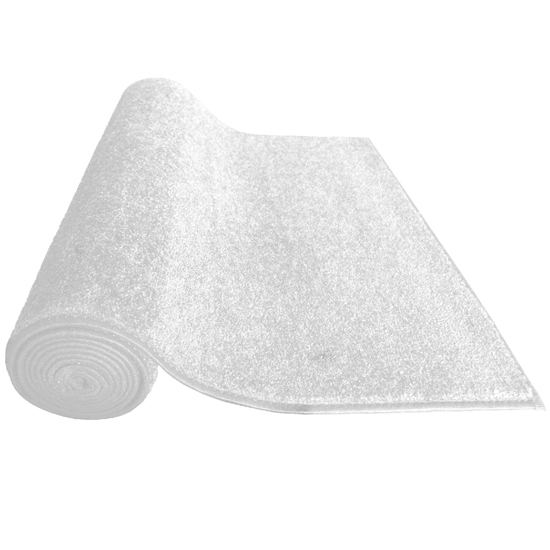 This wedding aisle runner is dressed in soft white fibers for a smooth, elegant stroll. It’s an excellent choice for the exhilarating journey towards the altar.